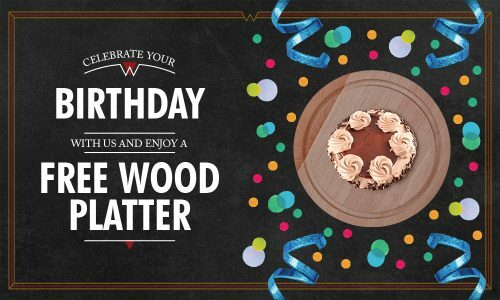 This offer entitles the birthday boy/girl to a free birthday wood platter presentation when a booking of at least 8 people is made in advance. If there are less than 8 people in the party, then the cost will be £2.95. This offer is valid all day, every day. Valid ID must be shown at reception and offer must be claimed within 10 days of the birthday date. The wood platter itself cannot be taken away from the restaurant and must be returned. This offer cannot be used in conjunction with any other offer and management reserves the right to alter or cancel the offer at any time.